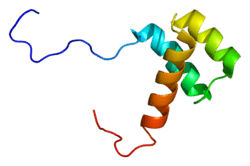 Homeobox protein Hox-B13 is a protein that in humans is encoded by the HOXB13 gene. This gene encodes a transcription factor that belongs to the homeobox gene family. Genes of this family are highly conserved among vertebrates and essential for vertebrate embryonic development. This gene has been implicated in fetal skin development and cutaneous regeneration. In mice, a similar gene was shown to exhibit temporal and spatial colinearity in the main body axis of the embryo, but was not expressed in the secondary axes, which suggests functions in body patterning along the axis. This gene and other HOXB genes form a gene cluster on chromosome 17 in the 17q21-22 region. Men who inherit a rare (<0.1% in a selected group of patients without clinical signs of prostate cancer) genetic variant in HOXB13 (G84E or rs138213197) have a 10-20-fold increased risk of prostate cancer. ↑ Zeltser L, Desplan C, Heintz N (Aug 1996). "Hoxb-13: a new Hox gene in a distant region of the HOXB cluster maintains colinearity". Development. 122 (8): 2475–84. PMID 8756292. ↑ Stelnicki EJ, Arbeit J, Cass DL, Saner C, Harrison M, Largman C (Jul 1998). "Modulation of the human homeobox genes PRX-2 and HOXB13 in scarless fetal wounds". The Journal of Investigative Dermatology. 111 (1): 57–63. doi:10.1046/j.1523-1747.1998.00238.x. PMID 9665387. 1 2 "Entrez Gene: HOXB13 homeobox B13". ↑ Ewing CM, Ray AM, Lange EM, Zuhlke KA, Robbins CM, Tembe WD, Wiley KE, Isaacs SD, Johng D, Wang Y, Bizon C, Yan G, Gielzak M, Partin AW, Shanmugam V, Izatt T, Sinari S, Craig DW, Zheng SL, Walsh PC, Montie JE, Xu J, Carpten JD, Isaacs WB, Cooney KA (Jan 2012). "Germline mutations in HOXB13 and prostate-cancer risk". The New England Journal of Medicine. 366 (2): 141–9. doi:10.1056/NEJMoa1110000. PMID 22236224. Shen WF, Montgomery JC, Rozenfeld S, Moskow JJ, Lawrence HJ, Buchberg AM, Largman C (Nov 1997). "AbdB-like Hox proteins stabilize DNA binding by the Meis1 homeodomain proteins". Molecular and Cellular Biology. 17 (11): 6448–58. PMC 232497 . PMID 9343407. Jung C, Kim RS, Lee SJ, Wang C, Jeng MH (May 2004). "HOXB13 homeodomain protein suppresses the growth of prostate cancer cells by the negative regulation of T-cell factor 4". Cancer Research. 64 (9): 3046–51. doi:10.1158/0008-5472.CAN-03-2614. PMID 15126340. Jung C, Kim RS, Zhang HJ, Lee SJ, Jeng MH (Dec 2004). "HOXB13 induces growth suppression of prostate cancer cells as a repressor of hormone-activated androgen receptor signaling". Cancer Research. 64 (24): 9185–92. doi:10.1158/0008-5472.CAN-04-1330. PMID 15604291. Zhao Y, Yamashita T, Ishikawa M (Apr 2005). "Regulation of tumor invasion by HOXB13 gene overexpressed in human endometrial cancer". Oncology Reports. 13 (4): 721–6. doi:10.3892/or.13.4.721. PMID 15756448. Jung C, Kim RS, Zhang H, Lee SJ, Sheng H, Loehrer PJ, Gardner TA, Jeng MH, Kao C (Jun 2005). "HOXB13 is downregulated in colorectal cancer to confer TCF4-mediated transactivation". British Journal of Cancer. 92 (12): 2233–9. doi:10.1038/sj.bjc.6602631. PMC 2361828 . PMID 15928669. Symmans WF (Apr 2006). "Genomic testing for sensitivity of breast cancer to hormonal therapy". Clinical Cancer Research. 12 (7 Pt 1): 1954–5. doi:10.1158/1078-0432.CCR-06-0289. PMID 16609001. Goetz MP, Suman VJ, Ingle JN, Nibbe AM, Visscher DW, Reynolds CA, Lingle WL, Erlander M, Ma XJ, Sgroi DC, Perez EA, Couch FJ (Apr 2006). "A two-gene expression ratio of homeobox 13 and interleukin-17B receptor for prediction of recurrence and survival in women receiving adjuvant tamoxifen". Clinical Cancer Research. 12 (7 Pt 1): 2080–7. doi:10.1158/1078-0432.CCR-05-1263. PMID 16609019. Cazal C, Sobral AP, de Almeida FC, das Graças Silva-Valenzuela M, Durazzo MD, Nunes FD (Jul 2006). "The homeobox HOXB13 is expressed in human minor salivary gland". Oral Diseases. 12 (4): 424–7. doi:10.1111/j.1601-0825.2005.01218.x. PMID 16792730. Ma XJ, Hilsenbeck SG, Wang W, Ding L, Sgroi DC, Bender RA, Osborne CK, Allred DC, Erlander MG (Oct 2006). "The HOXB13:IL17BR expression index is a prognostic factor in early-stage breast cancer". Journal of Clinical Oncology. 24 (28): 4611–9. doi:10.1200/JCO.2006.06.6944. PMID 17008703. Muthusamy V, Duraisamy S, Bradbury CM, Hobbs C, Curley DP, Nelson B, Bosenberg M (Dec 2006). "Epigenetic silencing of novel tumor suppressors in malignant melanoma". Cancer Research. 66 (23): 11187–93. doi:10.1158/0008-5472.CAN-06-1274. PMID 17145863. Miao J, Wang Z, Provencher H, Muir B, Dahiya S, Carney E, Leong CO, Sgroi DC, Orsulic S (Oct 2007). "HOXB13 promotes ovarian cancer progression". Proceedings of the National Academy of Sciences of the United States of America. 104 (43): 17093–8. doi:10.1073/pnas.0707938104. PMC 2040435 . PMID 17942676. Ewing CM, Ray AM, Lange EM, Zuhlke KA, Robbins CM, Tembe WD, Wiley KE, Isaacs SD, Johng D, Wang Y, Bizon C, Yan G, Gielzak M, Partin AW, Shanmugam V, Izatt T, Sinari S, Craig DW, Zheng SL, Walsh PC, Montie JE, Xu J, Carpten JD, Isaacs WB, Cooney KA (Jan 2012). "Germline mutations in HOXB13 and prostate-cancer risk". The New England Journal of Medicine. 366 (2): 141–9. doi:10.1056/NEJMoa1110000. PMID 22236224.